This Basic Guitar Lesson Shows The Best Right Hand Position. How the right hand is placed is really important for the fingerstyle guitarist. 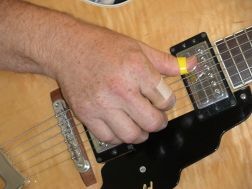 Placing your hand the right way when you're starting out will make learning to play easier. Of course some of the greatest fingerstylists in the world hold their right hand all wrong. That's not what makes them great. They're great players in spite of how they hold their hands. Here's an easy way to put your right hand in the right position. Hold your hand in front of your stomach like you're going to shake hands with someone. Now turn your hand so that your fingertips are pointed toward the floor. They aren't going to pointing straight down, but they will be pointed in a downward direction. Place your right hand on the strings over the guitar body. Your thumb will be pointing toward the guitar neck. Why go to so much trouble over turning your hand the right way? 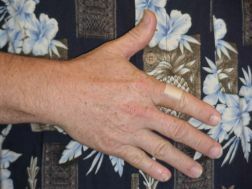 The main reason is that the correct picking hand position will keep your fingers from getting tangled up with your thumb. The more streamlined and efficient your technique is, the easier it'll be to play what you want to play. Please consider this; good habits are as easy to develop as bad habits. Developing a good right hand position is crucial for the fingerstylist.